These will fit a 700 series or larger multirotor! 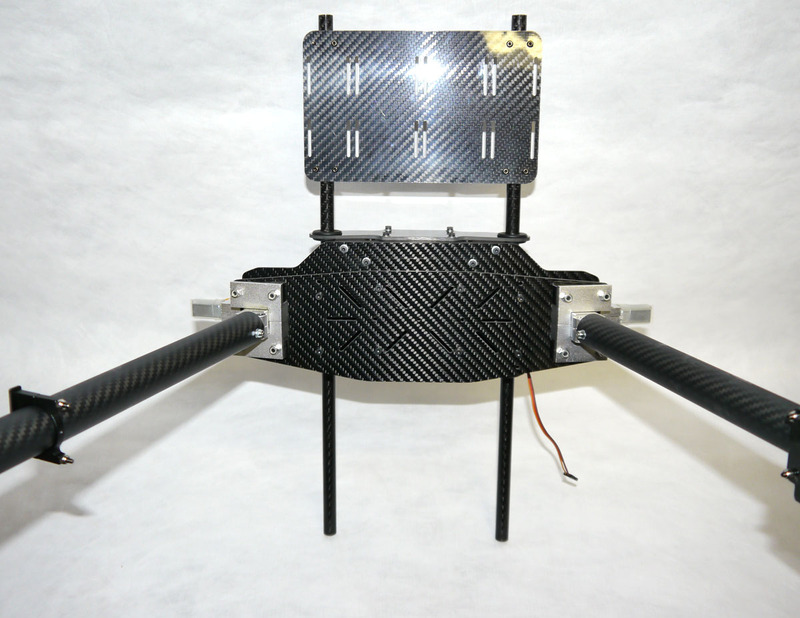 Mount these large retracting landing gear to to your 700 series or larger multirotor. 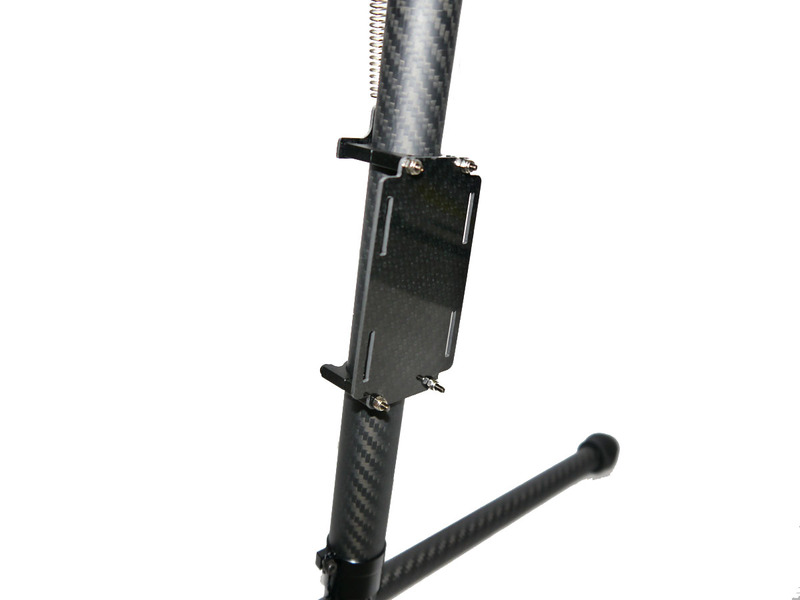 The Large Retracting Landing Gear has 12mm rails to mount your gimbal and/or other rail mount accessory. 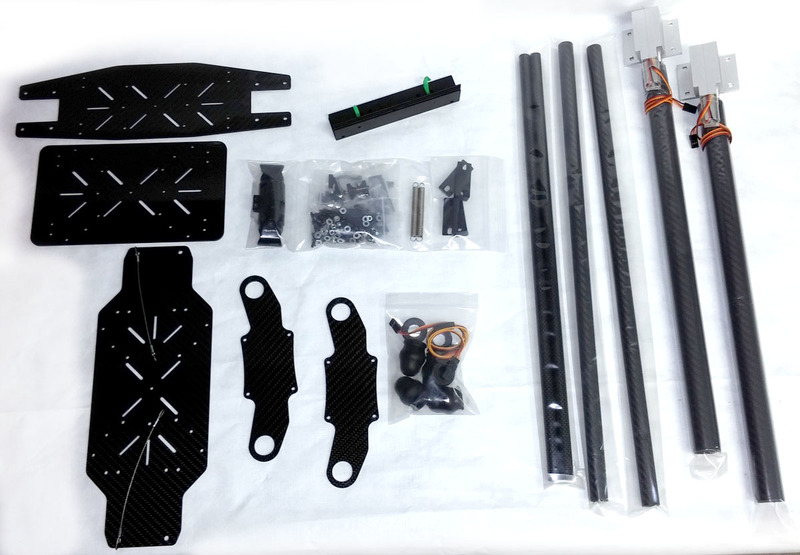 The included 2mm CF battery tray provides a large platform to mount accessories such as flight packs, FPV downlinks, auxiliary batteries or just about anything you can fit. All tubes are 3k twill weave carbon fiber with a matte finish to keep weight under control and a clean look. With gimbal mounting options including a 12mm rail mount a center mount for mounting a gimbal directly under the retracts or, mount your gimbal to a secondary plate up front and your flight packs in the back. Accessory plates are also available (sold separately) that mount to the leg down tubes providing a convenient location to mount radio equipment well away from components that may cause unwanted interference. There is any number of possibilities for securing to your craft and countless gimbals you can mount. With retracting landing gear you can take full advantage of your gimbals pan. 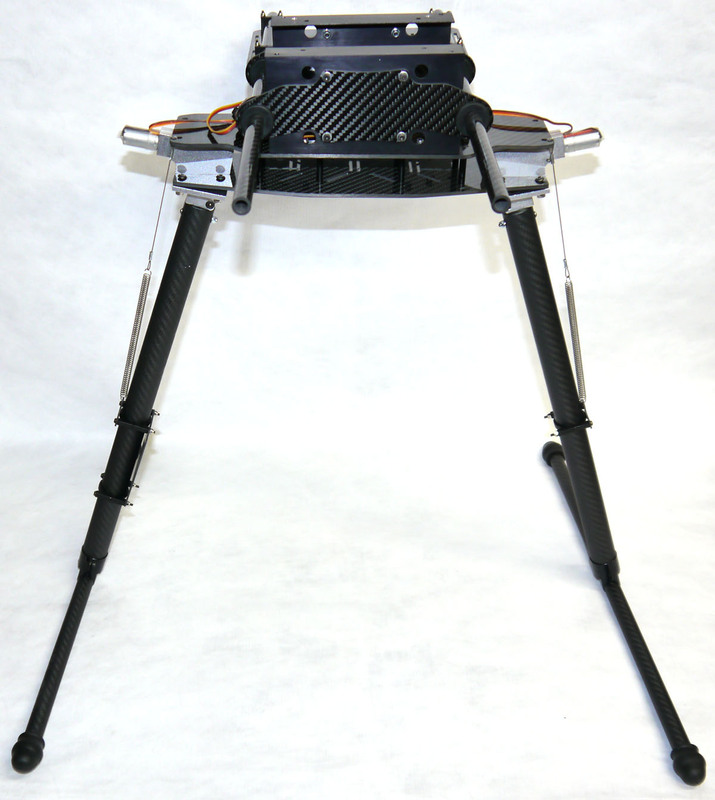 With the legs retracted you will be able to rotate your gimbal on its third axis to get a full panorama from the gimbal while your craft remains in one location. With this capability on a one man setup you are able to concentrate on your arial photography shot by panning your camera not your craft. If you fly two man, you will no longer have two people flying your shot, the pilot can focus on the flight and photographer can focus on the shot removing the confusion of trying to film, fly and pan. Many gimbals out there, both small and large, use a 12mm rail mount system to secure it and make it easily removable if desired. We have designed a couple rail and gimbal mounting options for you. The 12mm rails can be mounted to secure a gimbal such as the DJI Zenmuse Z15 line, a Photohigher AV200 or, many other gimbals that uses a 155mm width rail mount. If your gimbal does not use a rail mount to secure the gimbal we have cut several slots on the retract mounting plate to secure your gimbal to these retracts. If you want the ease of use, transportation and the balance-able aspects of a rail mounted gimbal but yours is not mountable to rails, you can purchase a second battery tray. Modify the plate, by drilling holes needed for your specific gimbal, then secure your gimbal to the plate and mount on the front end of the rails. To balance the gimbal mounted up front, there is a included rail mount battery tray that can be mounted in the back to balance everything out.. 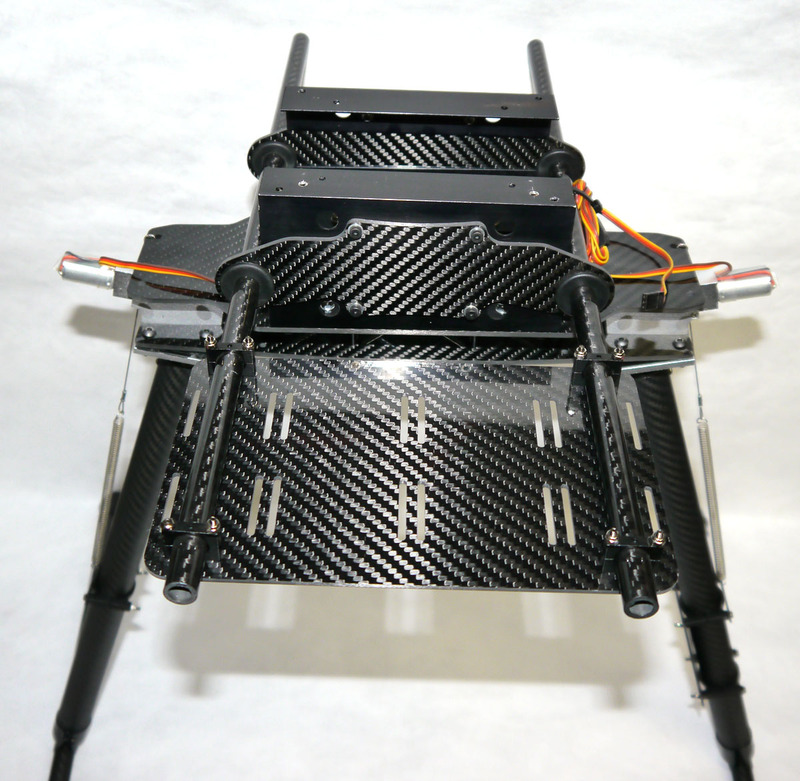 The tray has enough room to secure 4 - 6s batteries and still have room to the sides and on top to mount some accessory items like a video downlink, auxiliary battery or any other items you may want to add. Recommended craft weight: 20 lbs.